Monday, May 16th Final exams during regular class schedule (Periods 1-7). Tuesday, May 17th Please check with your teachers for exam dates. High School Softball – If you are interested in playing softball this year, there will be an informational meeting on Wednesday, May 4th during lunch in room 11-022. If you have questions see Coach Stoltzfus. High School Softball Tryouts begin next week, Monday, May 9th through Thursday, May 12 at Kent Stein Field #4 from 4-6pm. If you have questions please see Coach Stoltzfus. GSA – The GSA’s last meeting of the year will be Wednesday, May 4th in Room 130 in the Science Hall (Mrs. Walker’s Room) from3:45-4:45 pm. Even if you are not a member this year, but would like to join us for next year, please come to this final meeting to find out more about us. Seniors – All library books and materials are due by Tuesday, May 10th. If you need to keep a book longer for a class assignment, please contact Mrs. Keltner. Also, a reminder that all library fines need to be taken care of before graduation. Seniors – If you had a baby picture submitted for the yearbook, you can pick up the picture(s) in the Attendance Office starting today. If you have any questions, please see Katie Brown in Room 21-035. Attention MHS Students: Posted outside Student Services are the ID #’s of the students who qualify for an Academic Award and/or Perfect Attendance. Please check the lists to see if you are on the appropriate list before May 4th, 2016. If you are not on a list and feel you should be, check with Mrs. Edkin in Student Services for Academic Awards or Mrs. Chatfield in the Assistant Principal’s office for Perfect Attendance questions. Students listed will be recognized at the Academic Awards Assembly Thursday, May 12th @ 9:00 AM in the gym. Parents are also invited to the Awards Assembly. Looking for MHS Sports Programs from the 2014-spring and fall seasons, or the 2015-spring, fall, and summer seasons? They’re free! If interested, please see Mrs. Watson in the AD’s office. Adopt-a-Highway event scheduled for May 3rd for Jeff Schmelzer’s Work Study has been postponed. 2016 Graduates who were in Cantrell’s English 9 class should report to room 212 to pick up time capsules. Volleyball Information – All girls that intend on participating in volleyball this year, the Spring/Summer schedule is out and available to be picked up in the AD’s office – see Mrs. Watson. If you have any questions please contact Coach Martin. Seniors – All Silver Cord hours need to be turned in to Mrs. Anderson by May 6th, 2016. Are you interested in hosting a student from France for 4 weeks this summer? Language & Friendship is looking for a couple of families to welcome a French high school student into their home from June 10 to July 10. To apply, or for more information, go to languageandfriendship.com and click on the hosting link, or see Mrs. Paulsen in room 201. All students interested in the Work-Based Learning Manufacturing Program need to have applications with references completed and turned in to Mr. Kitzmann no later than Friday, May 13th. Summer Work Opportunity – Attention students! If you are interested in earning some money this summer, please stop by Student Services to pick up information about detasseling. 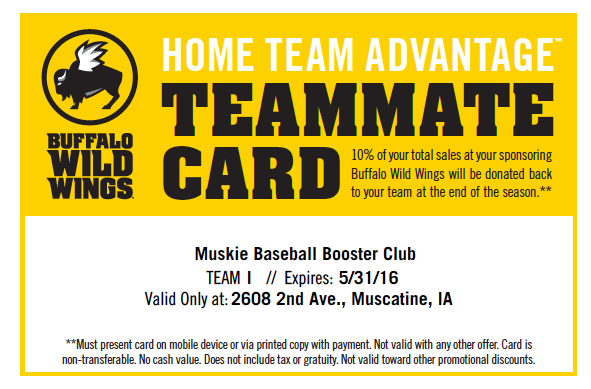 Muskie Booster Members Needed! The Muskie Boosters are currently recruiting new board members for the 2016-2017 Board. Board members help with special events like Fall kick-off, Cake Auction, etc. also helping with concession volunteers. The Muskie Boosters support all MHS sports, activities, clubs, etc raising funds and helping keep the activities/sports going. If you would like to hear more about being a board member or signing up for the board, please contact Susan Eversmeyer at saeversmeyer@machlink.com or Dena Bates at batesdc5@gmail.com. 4th Annual MCSD Race for Schools in on May 7, 2016. Registration forms are available at the Attendance Office. Students are needed to help at the Washington Elementary Community Celebration/Open House on Thursday, May 19th from 4:30 – 7:30PM. If interested, please contact Brian Walthart at brian.walthart@mcsdonline or by phone at 563-263-9135. Two students are needed to rearrange books in the Homeschool Office Library at the School Board Office. If you like to rearrange and organize things, this would be a perfect fit for you! Four (4) Silver Cord hours are available per student. If interested, please call the School Board Office at 563-263-7223 and ask for Gina or Kat. May 17 – Seniors Last Day! The NROTC Scholarship is a full-ride scholarship ($180,000) to any university that has an NROTC program. Upon graduating from college, they will be commissioned as a 2nd Lieutenant in the United States Marine Corps, leading Marines as young 22 year old! NROTC scholarship recipients will be debt free from students loans and have a guaranteed career with starting pay and allowances of up to $60,000! Some nearby schools are Iowa State University, University of Nebraska, University of Illinois, and Marquette University. Please stop in Student Services for more information. KWQC Broadcast Scholarship–They are offering (2)$1000 scholarships. Must live in the KWQC viewing area and plan on enrolling in broadcasting classes. Deadline is May 6, 2016. Pick up an application is in student services. Aspiring Nurse Scholarship: Nursing Schools Almanac has just launched its second annual Aspiring Nurse Scholarship. Our website will award a $1,000 scholarship to an aspiring nurse who best demonstrates: A track record of academic excellence, particularly in science and mathematics & A passion for the nursing profession and the overall field of health care. This scholarship is open to all high school seniors who plan to pursue a college education in nursing, including LPN / LVN, ADN, and BSN programs. Scholarship applications will be accepted until midnight on June 30, 2016. Visit www.nursingschoolsalmanac.com and click the banner on the right-hand side of the website’s homepage.